Chris Brown has been released from custody and his felony assault charge reduced to a misdemeanor. Over the weekend Chris Brown was arrested in Washington DC on suspicion of felony assault after he was accused of punching an over zealous fan in the face. Today at his arraignment the charges were reduced to misdemeanor simple assault because Chris Brown and his bodyguard’s version of what happened is different from the victim’s version of what happened. The assault happened outside the W Hotel at K and 15th streets at approximately 4:25 a.m. after an after party, say police. 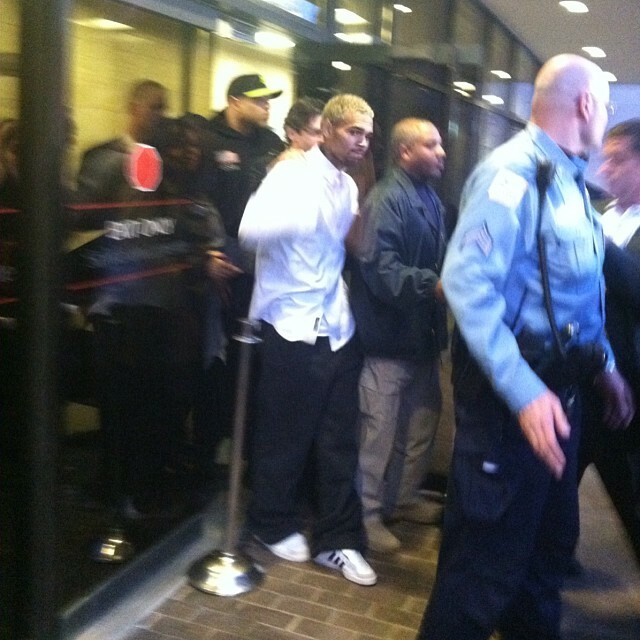 Brown was in town for an appearance at The Park nightclub, according to the police report. Brown and his 34-year-old bodyguard, Chris Hollosy, agreed to take a picture with a fan. According to the police report, the victim tried to jump in the picture before Hollosy and Brown both punched the victim. They retreated to their tour bus but stayed on the scene, according to the police report. The victim was treated and released from the hospital after suffering injuries to his face, say police. The Washington Post reports that Brown’s camp denies the story about taking a photo. Instead, the camp says the victim tried following two women on the tour bus and that led to the fight. A misdemeanor battery charge carries up to 180 days in jail and up to $1,000 in fines. The next hearing is set for Nov 25th. This entry was posted in Celebrity Sighting, Controversy, Entertainment. Bookmark the permalink.